The engineering design program, led by award-winning professor Patsy Brackin, will allow students—beginning in their first academic quarter on campus—to have hands-on experience designing real-world projects for clients. A new major in engineering design has been added to provide students with a broad foundation of engineering skills and a deep, multidisciplinary experience in design to meet the needs of a dynamic innovation economy. Students are enrolled to begin the new engineering design program during the 2018-19 academic year. 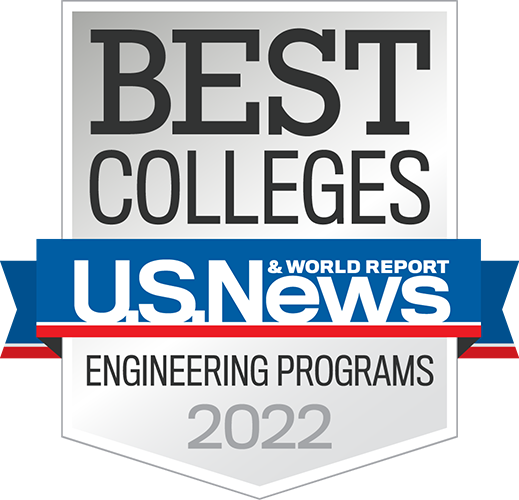 While design principles have long been considered a core competency within engineering education, Rose-Hulman will be unique in awarding an academic degree to students completing a comprehensive four-year design-centric curriculum along with a traditional engineering concentration, according to Engineering Design Director Patsy Brackin. “We’re taking the design element in an entirely new direction in engineering education and providing students with the core design skills to be key contributors in the new innovation economy,” said Brackin, an award-winning educator and distinguished Fellow of the American Society of Mechanical Engineering. Rose-Hulman’s engineering design program will allow students—beginning in their first academic quarter on campus—to have hands-on experience designing real-world projects for clients. A junior-year practicum, a co-op work assignment or an international project will give students valuable real-world experiences integrated with their chosen engineering concentration, enhancing their marketability upon graduation, according to Brackin. Learn more about the engineering design program at Rose-Hulman. The engineering design program takes an integrated approach involving faculty from mechanical engineering, electrical and computer engineering, biomedical engineering, software engineering and the humanities. 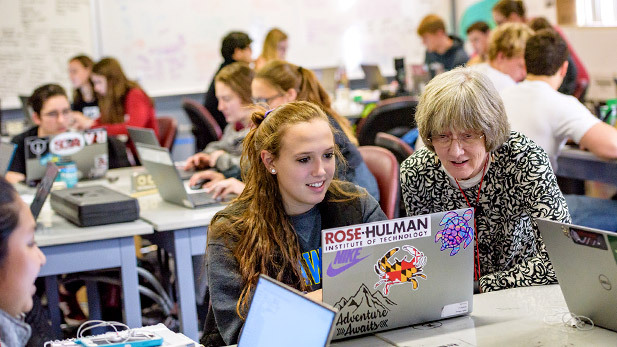 Provost Anne Houtman pointed out that incorporating engineering ethics and communication skills is another key component of the engineering design program, as it is with all Rose-Hulman majors. Prospective employers are seeking engineering graduates with fundamental design skills to enhance areas of research and development in their companies, and bring new ideas to the marketplace, according to Brian Dougherty, a Rose-Hulman 1993 electrical engineering alumnus who is the director of engineering for Rose-Hulman Ventures, a product design, rapid prototyping and development operation on the institute’s south campus. Elements of the new program were featured in an engineering design studio course for first-year biomedical engineering students during the 2017-18 school year. Teams of students redesigned tools for people with physical and mental challenges, examined ways to improve the manufacturing process of a local company and designed projects from scratch. Students also visited high-tech research and design centers in industry, learned design techniques from art teachers and worked alongside professional technicians in the campus machine shop.